Dr. John Redd is a leading provider of advanced digital and traditional dental services to patients throughout the Tampa, FL area. At the practice, Dr. Redd offers services such as Zoom® teeth whitening, laser cavity detection, ceramic crowns, oral cancer screening and detection, ceramic veneers, application of Invisalign®, and advanced same-day digital dental treatments. American Dental Association since 1992, the Florida Dental Association since 1992, the West Coast Dental Association since 1992, the Hillsborough County Dental Association since 1992, and the American Academy of Cosmetic Dentistry since 1998. At Tampa Smiles, Dr. Redd works hard to provide the highest quality of dental care to each and every one of his patients and believes that pursuing the latest in dental innovations is the key to outstanding, lasting results. By providing his patients with the best in dental treatments time and again, Dr. Redd has proven that residents of Tampa, FL can feel confident placing their trust in this expertly trained dentist. Dr. Redd and the entire staff of Tampa Smiles welcome all new patients, of all ages, to the practice. 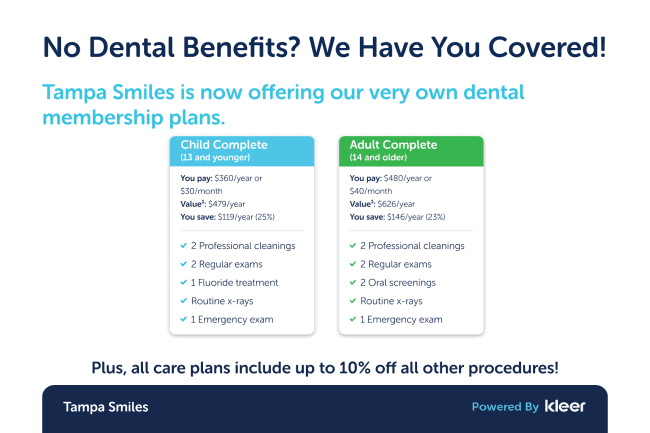 Most major forms of dental insurance will be accepted. "I want to thank you all for the utmost in quality care and professionalism. Your office is always friendly and I am always made to feel welcome." "I just wanted to thank you so much for my new smile! I can not tell you how much I appreciate your patience and expertise when it came to working on my teeth." "I'd like to take a moment to say thank you to you and everyone at The Spring of Tampa Bay for everything they have done to help me get back my life."